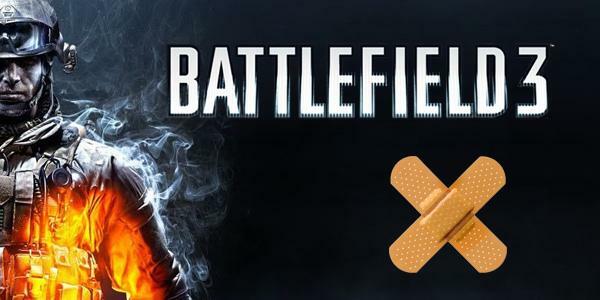 Après beaucoup de critiques autour de Battlefield 3 sur les nombreux bugs qui touchent le jeu, DICE a dressé une liste des correctifs qui seraient appliqués dans le prochain patch à venir. Aucune date sur la sortie de ce patch n'a pour l'instant était entendue. Celui-ci concernerait les trois plateformes Xbox 360, PS3 et PC. -The A10 properly gives Jet score again. -Unguided tank rounds and RPGs will now instantly destroy Jets, Attack Helicopters, and Scout Helicopters. -Increased the damage the MBT's primary weapon does to the front and side armor of other main battle tanks. Primarily this means 1 less shot to the front, and very good hits to the side can result in a 1 hit to disable. -Slightly reduced the repair speed of the repair tool. -Increased the damage done by TOW weapons to armored vehicles. -Increased the rate of fire and minimum damage of the Coax HMG. -Increased the damage mounted gunner .50cal HMGs do at long range. -Increased the power of the repair tool when killing soldiers or destroying vehicles slightly. -Fixed a problem when locking on to two nearby targets, the locking should no longer jump rapidly between multiple targets. This applies to all locking weapons and Laser Designators. -Increased the damage of the Javelin and Air to Ground missiles against laser designated targets. -Javelin missiles fired without Laser targeting now do more damage to the side and rear of MBTs. -Slightly reduced the locking time of all weapons vs Laser Designated targets. -Laser Guided missiles can now be distracted by Flares. -Increased the locking distance for AGM Missiles for Jets when locking on laser designated targets. -Reduced the locking time for the AGM Missiles for Jets to make them more viable against ground targets. -Reduced the locking time for AA Missiles for Jets to make them more viable against air targets. -Flares will no longer break the lock of a vehicle that is locked on, it will only distract the missiles. -Flares now more reliably distract missiles, especially for Helicopters. -Flares for Jets and Choppers now reload at 11 seconds again, except for the gunner, which remains unchanged at 20sec. -AA Missiles are more difficult to dodge in Jets, this was unintended behavior that created an imbalance against skilled pilots. -AA Missiles should no longer kill the pilot instead of the vehicle. -AA Missiles should no longer detonate before hitting their target or a Flare/ECM chaff cloud. -Reduced the damage AA missiles do to jets to 45%. -Fixed the SU-35 firing Air to Air missiles at a lower rate of fire than other vehicles. -The IGLA and Stinger now lock on much more quickly and disable an attack aircraft in 1 hit, but have significantly reduced range. This should allow Stingers to mount an effective close range point defense, without dominating an entire airspace. -Increased the speed of the Helicopter AA missiles lock on to reduce the tedious nature of Helicopter dogfights and improve the Helicopter's defensive abilities vs Jets. -Slightly reduced the damage of Jet cannons against Aircraft. Damage is now only slightly higher than it was originally at launch. -Increased RPG and SMAW damage against aircraft. -Guided Rockets will now only track ground targets, as originally intended. -Reduced the direct damage done by Attack Helicopter gunners vs Armor. -Helicopter guns should now suppress correctly. -Improved the accuracy of the Attack Helicopter's Rocket Pods, both guided and unguided. -Slightly increased the damage of Attack Helicopter's Rocket Pods vs Infantry and other Helicopters. -Additional fixes have been made to the TV missile to prevent it from blowing up the lauching vehicle. -The Mi28 has received upgrades to its climbing and yawing abilities. -Fixed an issue where guided rockets from the Mi28 did not follow the crosshair properly. -Improved the accuracy of the Mi28 gun to match the AH1 gun. -Increased the direct hit damage of the APFSDS rounds for the IFVs. -Decreased the locking time of the IFV Guided Missile to make it more viable as an unlock. -Miniguns and Helicopter Gunners now more quickly destroy parked cars. -Increased the power of explosions from cars and other explosive static objects. -Dying from the explosion of a car or other explosive static object should now correctly credit the player who caused the explosion. -Adjusted the F35's Center of Mass and Hover Engine for more stable, level flight in all flight modes. -Updated the F35 weapon systems to be consistent with the other Jets. -The F35 will now only attempt to enter Hover at low altitudes, though it will maintain the hover until forward flight is resumed, even if it reaches high altitude. -The F35 and SU35 now properly have Ejection seats to prevent players from being killed when exiting the vehicle. -Changed the Kornets to TOW launchers on Wake Island and moved the spawn position of the AAV to a more level position. -Fixed several bugs with air vehicles colliding with objects at high speeds and taking no damage. -Players will no longer receive suicides or team kills if they crash their vehicle (dying is punishment enough). -The MAV will no longer destroy vehicles that run into it, instead it should be destroyed. -Jet and Helicopter collisions should now properly result in the death of both vehicles. -You can now spot with the EOD bot. -Increased the base accuracy for AA guns and added a decrease in accuracy over the course of a burst. -Reduced the damage AA guns (both mobile and stationary) do to infantry. -The carrier based CRAM stations are now properly tracked as stationary weapons. -CRAM and Pantsir stationary AA weapons now have Air Radar equipped by default. -Improved the sound feedback for damage to help players better understand the amount of damage their vehicle is taking. -The A10's extinguisher should now function properly. -Disabled vehicles now have an increased reverse speed to help escape to cover after being disabled. -The T90's crosshair now more accurately represents the trajectory of the main gun. -Toggle and Hold zoom settings now also apply to soldier controlled turrets on jeeps, transport helicopters, boats, and IFVs port guns. -The AAV now has zoom and a 3P camera when using the turret. -Tweaked the AAV's turret controls to be more useful when the vehicle is moving. -The Z11w now properly functions with Below Radar. -Below Radar will now also prevent the lock on of Stinger and IGLA missiles. -Added Horns to all Jeeps. -Tanks can no longer drive into the water and cross the Wake Island lagoon completely submerged. -Added Extended Mags to the ASVAL. The Extended Mags can be unlocked at 200 kills with the AS VAL. -Reduced the recoil of the SKS rifle and increased its maximum damage at close range. -Fixed aimed firing max accuracy on the Pecheneg to be consistent with other LMGs. -Semiautomatic and automatic shotguns firing FRAG rounds now do slightly less splash damage. -The M26 MASS frag and slug rounds are now the more effective pump action versions. -The M26 MASS and M320 now benefit from the Laser Sight when mounted with an Underslung Rail. -Fixed the bolt action timer on the L96 that would cause an animation glitch. -9x39mm rounds no longer benefit from the Sniper headshot bonus. -Increased the damage of the 9x39mm rounds at long range. -Fixed the AKS74u damage at max range, it was incorrectly higher than other carbines. -Increased the damage of the .357 and .44 magnum rounds at max range. -All semiautomatic and bolt weapons, including all shotgun slugs, now have their maximum damage out to 15m. -Semiautomatic weapons will no longer "jam" if the player presses fire faster than the weapon is capable of shooting. Some semi-automatic weapons have had their rates of fire adjusted to fit this change. -Bolt action sniper rounds now have a chance to kill at close range if the player is hit in the upper chest. -Semiautomatic sniper rifles, Assault Rifles, LMGs, and shotgun slugs now have more consistent damage over long range. At maximum range shots to the legs will not require more hits to kill. -The spread for Flechette rounds has been reduced slightly on all shotguns. -The spread for Buckshot has been reduced on the M1014, DAO-12, and S12k. These weapons have an accuracy advantage over the USAS12 but are not as accurate as the 870. -Zooming shotguns with Buckshot and Flechette loads will now result in a slightly tighter cone for the pellets. -Reduced the delay time between quick knife attempts slightly. Attacks with the knife drawn are still significantly faster. -Fixed the Rate of Fire when the USAS and MK3A1 are equipped with FRAG rounds. All other shotguns correctly had a reduced rate of fire with frags, except the USAS and MK3A1. -Fixed an Accuracy bug when the MK3A1 shotgun is equipped with FRAG or Slug rounds. -Shotguns equipped with slugs will no longer automatically begin reloading if the weapon is zoomed when the clip is empty. This allows players to see where the slug lands before reloading. -Fixed 12g FRAG rounds not breaking glass at long range. -Players can now earn the shotgun Ribbon using the M26 MASS. -The underslung grenade launchers for Russian rifles now properly report GP30 in the kill log. -Fixed the AEK971 40mm shotgun round listing itself as FRAG in the kill log. -Fixed the 40mm smoke grenade so it no longer passes through soldiers and unbroken objects before it detonates. Several weapons have had recoil or accuracy adjusted in orer to balance these weapons in effectiveness and also increase the feeling of individuality in each gun effectiveness and also increase the feeling of individuality in each gun. - M27 IAR: No change. The M27 is a heavier version of the M416, giving it good all-around performance though it has worse performance on the move. - RPK-74M: Reduced the initial recoil and vertical recoil. The RPK-74M is a more stable firing platform than the comparable M27, though it lacks the M27's higher rate of fire. - M249: Added an initial recoil. The M249 is the fastest firing belt fed LMG, giving it superior suppressive and damage abilities. The initial recoil makes it a bit harder to run and gun, while making little overall impact on performance. - Type-88: Slightly increased the initial recoil, reduced muzzle drift. The Type88 fires the slowest of the medium caliber LMGs, though what it lacks in rate of fire it makes up for in controllability. - PKP: Reduced recoil but added a slight initial recoil, increased damage at max range. The Pecheneg has a heavy vertical recoil with a hard hitting round and little drift, this makes it excellent at sustained fire. - M60: Reduced the initial recoil, increased damage at all ranges. The M60 has a very low rate of fire that makes it the most controllable with the powerful 7.62x51mm round. - M240B: Added an initial recoil, increased damage at all ranges. The fastest firing medium MG, the M240 has a substantial muzzle kick and drift that makes all that power difficult to control. - QBB-95: Reduced the total recoil but increased muzzle drift and initial recoil. The QBB-95 should now kick harder but settle into full auto fire better, combined with the bullpup hip fire bonus this makes the QBB-95 a highly mobile LMG. - MG36: Added an initial recoil. The MG36 fires at a fast 750rpm and makes a nice middle ground between the controllability of a clip LMG and the sustained firepower of a belt fed LMG. - 870: No change. The 870 is a popular and highly effective weapon. - DAO-12: Reduced the total pellets fired from 12 to 9. The DAO-12 has a high magazine capacity with a slow reload that makes it a solid all around shotgun. - M1014: Increased the rate of fire from 200 max to 210 max. Reduced the total pellets fired from 12 to 9. The M1014 was underperforming compared to the USAS12 and 870, it should now be more viable in CQB thanks to a higher rate of fire. - S12k: Increased extended mag from 8 rounds to 10 rounds. Reduced the total pellets fired from 12 to 9. The S12k larger extended magazine but slower rate of fire should make it stand out against the M1014, while the DAO-12 has a higher capacity over all, but a slowe reload. - MK3A1: Increased magazine capacity to 8 and 12 for normal and extended mag respectively. Reduced the total pellets fired from 12 to 9. The MK3A1 has a lower ROF than the USAS12, giving it slightly more ammo makes this an edge vs the USAS. - USAS-12: Increased the initial recoil. Reduced the total pellets fired from 12 to 9. The USAS 12 has a higher ROF than other shotguns, this recoil change better balances that advantage and the pellets balance its damage output. - M4A1: No Change. Well-rounded carbine, with good rate of fire and controllable recoil. - M4: Increased vertical recoil, reduced horizontal recoil. The Burst only M4 should now feel different to its automatic sibling, the reduced horizontal recoil emphasizes the greater control you have in burst fire. - AKS-74U: Reduced initial recoil and vertical recoil. The AKS-74u's low rate of fire is paired with great controllability. The overall increase in sustained fire control should help this carbine stand out, while the first kick gives it character. - SG553: Reduced initial recoil and vertical recoil. The SG553 is a lower rate of fire carbine with greater controllability than the G36C. The change to initial recoil should better highlight this difference. - A91: No Change. The A91's high rate of fire and bullpup from the hip accuracy is offset by a poor controllability on full auto. - G36C: Reduced initial recoil. The G36C is a well-rounded carbine, with a medium rate of fire and a medium recoil. The 2 round burst mode gives this weapon an edge at mid-range. - SCAR-H: Increased damage at maximum range and increased max range. The SCAR-H fires a heavier round than all other carbines, giving it better stopping power at range at the cost of a low fire rate that penalizes it in CQB. - G53: Reduced recoil and drift, recoil settle times now similar to other carbines. The HK53 is a short carbine with a lot of initial kick but a stable recoil pattern and a medium rate of fire. The changes give it more character compared to the G36. - QBZ-95B: Reduced muzzle sway, recoil settle times now similar to other carbines. A bullpup like the A91, the - QBZ-95B is steady on the move with a lower rate of fire for controllable shots at longer range. The built in foregrip is now properly reflected in the weapon's stats. - AK-74M: Reduced initial recoil and vertical recoil. The AK-74M sacrifices rate of fire for controllable automatic fire, the initial recoil was negatively affecting the feeling of controllability. - M16A3: No Change. The M16 (both A3 and A4) provide a well-rounded stable firing platform with a high rate of fire that is relatively controllable. - M16A4: Increased vertical recoil, reduced horizontal recoil. The Burst only M16A4 should now feel different to its automatic sibling, the reduced horizontal recoil emphasizes the greater control you have in burst fire. M416: No change. The M416 is the middle ground AR, blending a medium recoil and rate of fire. - AEK-971: Increased initial recoil, reduced aimed accuracy slightly. The AEK has a very high rate of fire, and also a large muzzle drift that makes control difficult. The low initial recoil allowed a player to kill before the weapon's weaknesses kicked in while the reduced accuracy highlights its close range role. - F2000: Reduced vertical recoil, increased zoomed accuracy slightly. As a bullpup, the F2000 has a bonus to accuracy on the move and from the hip while its high rate of fire sacrifices controllability for saturation. The previous changes were an overreaction, this is a corrective update. - AN94: Reduced vertical recoil. The AN94's 2 round burst mode is incredibly accurate, but it suffers from a low rate of fire on fully automatic. The recoil in full auto has been reduced somewhat to offset this penalty and make the AN94 more attractive. - G3A3: Increased damage at all ranges, reduced vertical recoil. The G3A3's heavy recoil and heavy round are offset by a low rate of fire and a small magazine. The G3A3 was clearly outclassed at all ranges. - KH2002: No Change. The KH2002 is locked to burst fire, with a high rate of fire and a large muzzle drift the weapon favors accurate mid-range fire. - L85A2: Increased accuracy, reduced muzzle drift. The L85 differs from other bullpup style ARs by having a low rate of fire, the accuracy and controllability were too low to offset the rate of fire. - FAMAS: The FAMAS combines an extreme rate of fire with extreme recoil making it very difficult to use at anything other than close quarters combat. Due to update restrictions, the FAMAS had different stats on all 3 platforms. The FAMAS is now uniform on all platforms and now has the correct 25 round magazine. - PP2000: Reduced the initial recoil. The PP2000 has a lower ROF than other PDWs and needed the controllability to be balanced. - UMP45: Reduced accuracy loss during full auto. The UMP45 hits hard and has a controllable recoil at the cost of a heavy initial recoil kick. - MP7: No Change. The MP7 has a very low recoil and a high muzzle drift that favors longer bursts than the P90. - AS VAL: Increased vertical recoil, reduced first shot recoil, reduced accuracy on the move. The AS VAL fires a long range, highly accurate, high damage projectile that favors short bursts or single fire when stationary. While still quite good from the hip, the AS VAL will suffer if fired while moving and aimed. - PDW-R: Reduced the initial recoil. The PDW-R has high recoil and favors burst fire, the added initial recoil was making it less effective in small bursts. - P90: Reduced the initial recoil. The P90 favors a run and gun play style using long bursts to control muzzle drift, the initial recoil was making bursting ineffective. - PP-19: Slightly reduced the initial recoil when firing, increased base damage. The PP-19's high initial recoil was over penalizing the burst fire needed to be effective on the low damage, high capacity weapon. -Fixed the 7x scope not zooming to the full 7x on all weapons. -Corrected the M39's laser sight so it points at the point of impact and aligns with scopes when zoomed. -Fixed a misaligned scope crosshair on the G3A3 using the Rifle Scope 6x. -Fixed the PKA and PKA-S scopes on the M416 having swapped zoom levels. -The L96 Straight Pull bolt now functions properly. -The L96 ironsights have been adjusted for a clearer aiming picture and correct use of the integral front sight. -The L96 now properly shows scope glint when using the 8x, and 12x scopes. -Tweaked IRNV to be more consistent across all levels. -Fixed a rendering issue with IRNV view when taking damage. -Tweaked the IRNV zoom times and scope visible areas to be the same across all weapons (some were faster than others). -The Accuracy increase and Recoil reduction of the Bipod has been significantly improved for Assault Rifles and Carbines. -The Bipod now provides similar Accuracy and Recoil benefits no matter if the weapon is fired while aiming or without aiming for all weapons. Previously only LMGs were worked this way. This especially improves the speed at which snipers can make follow up shots, and also allows effective unaimed suppressive fire with Assault Rifles and Carbines. -Increased the Speed at which a bipod is deployed, allowing the user to obtain the bipod's bonus sooner after the deploy has started and allowing the weapon to be aimed in a far shorter time. The speed has been increased 40-50%, depending on the weapon and animation. -The Vertical Recoil penalty of the Heavy Barrel has been reduced. The value has been changed from a global percent increase to a weapon specific value. -A small Hip Accuracy penalty has been added to the Heavy Barrel to represent the added weight of the accessory, as well as focus the attachment on accurate mid and long range fire. The exact penalty amount is a weapon specific value. -Several weapons with low default bullet speed now have their bullet speed increased when the Heavy Barrel is equipped. This is in effect for the A91, G3A3, AKS-74u, G36C, M4A1, SCAR-H, SG553, G53, and QBZ-95B. -The Heavy Barrel is now also paired with Match Rounds which increase the maximum range of the weapon. The minimum and maximum damage are unchanged, weapons with the Heavy Barrel will be more effective in mid range. -The Aimed Accuracy bonus provided by the Heavy Barrel has been increased. This will increase the effectiveness of the Heavy Barrel for small bursts, as originally intended. -Fixed the QBU-88 sniper and the L96 IRNV scopes to use the proper sniper reticule. -The Horizontal Sway reduction has been changed from a global percent reduction to a weapon specific value reduction. For most guns this means very little change, for guns which have a large horizontal recoil the change is more substation. The FAMAS, F2000, and AEK971 are most effected, the AK-74, M16, and M416 are nearly unchanged. -A small long range Aimed Accuracy penalty has been added to the foregrip. Players who generally find themselves fighting at mid to long range may want to change their accessory, while players fighting in CQB will go largely unaffected. Combining the Foregrip with a Silencer or a Heavy Barrel will offset this penalty. -The Hip Accuracy bonus provided by the Laser Sight has been increased. Some PDWs have had their crouch and prone base stats adjusted to prevent hip firing being more accurate than aimed fire when using a laser sight. -The bonus is now a weapon specific value instead of a global percentage, some guns receive larger or smaller bonuses, though all bonuses are better than they were previously. -The Suppressor no longer reduces the maximum damage of a weapon when equipped. Instead the Suppressor reduces the minimum and maximum range of the weapon, making it ideal for CQB and Stealth. This change will make the Suppressor slightly more effective at long range, where the bullet drop and speed makes shots difficult already, and reduces the power of the suppressor at mid range slightly. -The Suppressor's recoil bonus remains unchanged at a global 10% decrease. This is less than the Flash Suppressor's bonus for all weapons. -The Hip Accuracy penalty of the Suppressor has been changed from a global percentage to a per weapon value. Generally this penalty is higher now, but not for all weapons. Specifically, the belt LMGs and bolt Snipers do not have any additional hip fire penalty, as their penalty is already at the maximum possible value. -Reduced the Aimed Accuracy bonus of the Suppressor from 50% to 25%. A Suppressor and Foregrip combo will have similar accuracy to a weapon without any Accessories, at the penalty of worse Hip Fire Accuracy and Range and with the benefit of much improved Stealth and reduced Recoil. -The Flash Suppressor no longer reduces accuracy for Automatic Fire. -The Flash Suppressor now also works as a recoil compensator, reducing the Vertical Recoil by a weapon specific value. This bonus is larger than the bonus provided by the Suppressor. -A small Hip Accuracy penalty has been added to the Flash Suppressor to represent the added weight of the accessory. The exact penalty amount is a weapon specific value. -Reduced the spot times on C4 and Claymore projectiles from 30 to 15 sec. -Tweaked the controls and physics for the EOD bot to improve its handling and aiming capabilities. -The Radio Beacon, Mortar, MAV, EOD bot, T-UGS, and SOFLAM should now be much easier to deploy. -The MAV will now be destroyed when running into a soldier or vehicle at high speed. It is still possible to strategically sacrifice your MAV on a soldier; it will be destroyed in the process. -The MAV now properly shows up in the Kill Feed. Previously it simply displayed "KILLED." -The MAV can no longer be used as an elevator. -Matched the motion sensor sweep frequency and range on the MAV to the TUGS. -Players will no longer auto enter SOFLAM, MAV, and EOD bots after they are deployed. -Players may now use their knife to destroy enemy equipment. -C4 will no longer be detonable after a player respawns, if the player is revived within 5 seconds he can still detonate his C4. -The player may now have a maximum number of mines which will persist after the player's death. Deploying more than the maximum of 6 mines will remove a previous mine from the world. -Claymores now live up to 5 seconds after a player dies, the player can have a max 2 claymores planted at the same time. -Claymores can now detonate from vehicles and can be used to disable jeeps or kill the passengers in light jeeps. Claymores will not do any damage to heavy vehicles. -Ammobags now stay until the user redeploys them like Medkits. -Ammobags resupply bullets more quickly, but explosives resupply more slowly, especially 40mm grenades. -Slightly reduced the effective blast radius of the RPG, SMAW, and 40mm grenade projectiles against infantry. -Reduced the total number of RPG and SMAW missiles carried from 5 to 4. Players desiring more rockets will want to use the Explosive spec. -Slightly increased the heal rate of the Medical Crate. -The M224 Mortar can no longer be deployed in an area that is out of combat for another team like a home base or other protected spawn. -Tweaked M224 exit points so the player faces in the direction of the mortar when he exits. -Mines, Claymores, C4 and other deployable items will now only appear on the minimap when spotted by a teammate. -Fixed a bug where players would spawn close to the enemy team at the start of the round. -Tehran Highway playable area has been doubled and is now the same as the Squad Deathmatch set up. Spawn points have been tweaked, and an extra spawn zone has been added north of the footbridge. -Kharg Island has a new spawn zone layout, along with a bigger playable area and new cover objects. Spawn points have also been tweaked. -Strike at Karkand spawns zones have been tweaked to improve player flow. Spawn points have been tweaked to improve safety upon spawning. -Sharqi Peninsula spawn zones have been adjusted to optimize player movement. Spawn points have been tweaked so players spawn more safely. -Seine Crossing spawn zone set up has been improved. There is a new spawn zone by the alleyway to the northwest with additional spawn points. -Caspain Border spawn zones have been tweaked slightly. -Tehran Highway now features an extra spawn zone north of the footbridge, along with tweaked spawn points. -Noshahr Canals spawn zones have been tweaked. Removed unsafe spawn points in the Northeast corner, and in the middle of the container area to the Southwest. Un patch pour Battlefield 3 bientôt déployé!